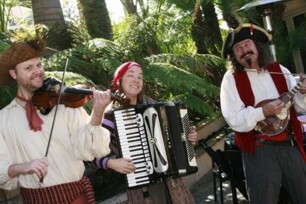 We are Pirate Birthday Party entertainers. 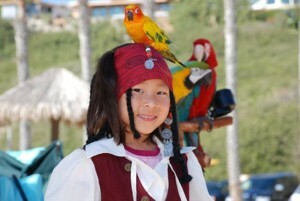 Call Pirates for Parties for the ultimate pirate birthday party. We offer three birthday party packages: the basic package, the deluxe package, and the Grand Production Party. 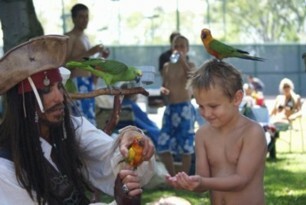 Captain Jack is a welcome guest and surrogate host at any type of party or event and is always a hit at any pirate themed party or birthday party for boys and girls from three years old and up. 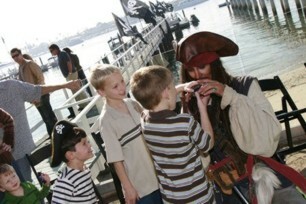 Captain Jack will initiate the birthday child into the Pirates inner circle as well as initiating all the kids as pirates, then there is a treasure hunt and the pirate tutorial sword training with rubber swords. Call for all the details for the pirate party. Read the letters from birthday party customers See More kids birthday party pictures below. See pictures of a Grand Production kids pirate party here - What happens at a pirate party? We provide everything for the pirate themed event. Captain Jack, or a whole crew of pirates, pirate bands, pirate entertainers, pirate shows, parrots and parrot shows, pirate props & decoration. We offer complete event design and event planning for corporate events, public events and non profits. We can work with any budget to make your special event unforgettable. 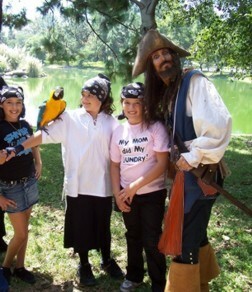 We will send you the best pirate entertainer in your area or any of our pirates can travel to your location.